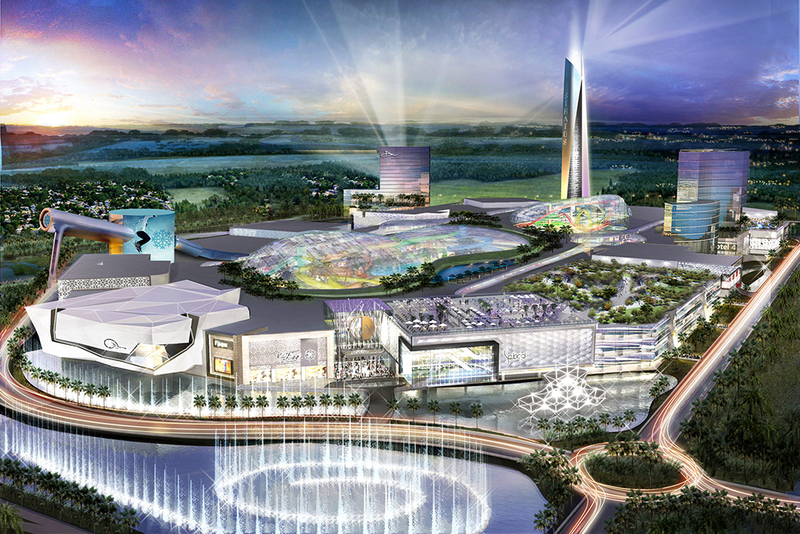 On May 7, the largest mall in the country received approval from the Miami-Dade county planning board. The approximately 500-acre project, dubbed The American Dream Miami, is led by Canadian developer, Triple Five. 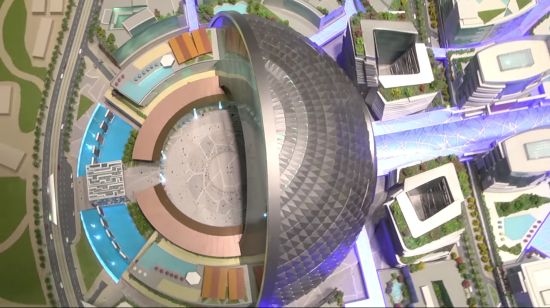 The $4 billion, 6-million-square-foot entertainment center’s design includes features such as an artificial ski slope, an indoor water park, and submarine rides. Located 200 miles from Disney World, the American Dream is hoping to provide a competitive alternative in closer proximity to southern Floridians. Ringed by the I-75, the Florida Turnpike, and a band of palm trees, Triple Five’s design rises as a singular mass punctured by high-rise glass hotels, rooftop components and undulating glass skylights. However, according to the Sun Sentinel, scores of malls in the area oppose the project as it threatens to inundate an already saturated retail complex market. Located over five miles from the nearest Metrorail stop, the Miami Herald reports that the developer has agreed to invest in its own bus depot and fund the extension of preexisting bus lines to The American Dream. Regardless of this transit overture, the sprawling complex will be highly reliant on the adjacent I-75 and Florida’s Turnpike to accommodate the estimated 100,000 daily vehicle trips generated by visitors and employees. Although malls across the country are closing shop, Triple Five is also moving forward with a 3 million square-foot entertainment complex in East Rutherford, Jersey. In total, these two new projects will bring Triple Five’s portfolio up to four locations, including Bloomington, Minnesota’s Mall of America which currently holds the title for the third largest mall in America. While Triple Five has received approval from the county planning board, the developer still has to secure new zoning variances, additional financing and propose storm water runoff infrastructure. The project will be subject to a final vote on May 17. In the world of shopping mall design, Victor Gruen’s name reigns supreme. The Austrian-born architect and urban planner is responsible for many early suburban shopping malls, which, believe it or not, were originally envisioned as pedestrian oases bustling with musical events, art, and civic functions. Gruen pioneered the typology, creating both the first open-air and the first fully enclosed suburban malls—the Northland Mall in Southfield, Michigan, and the Southdale Mall in Edina, Minnesota. Not one to be limited by geography, Gruen also built similar complexes across the rest of the country. Though Gruen’s early works were originally designed for the automobile age, many have persisted and today are facing radical change. Converging trends in e-commerce and urbanization have lead to the increasing obsolescence of suburban shopping malls, the so-called “death of retail.” Of the malls that remain, several— like the Southdale Mall—are currently undergoing renovations to suit modern times. Gruen Associates, 70 years after its initial founding, is working on several suburban mall adaptive reuse projects. The Architect’s Newspaper’s West Coast editor Antonio Pacheco spoke to several of the firm’s designers—Ashok Vanmali, partner; Devon Barnes, principal associate; Matthew Parrent, senior associate; and Orlando Gonzalez, associate— to investigate how the “death of retail” is affecting suburban shopping mall design. The Architect’s Newspaper: What does your team make of the so-called “death of retail?” Devon Barnes: It’s not that that there’s less desire for consuming goods; there’s just much less interest in static places. Between a traditional shop on 5th Avenue and a pop-up on the High Line, for a loose example, the latter may be more successful right now. Why? Because it's a temporary, unique, experience-based, and placeand location-driven. Ashok Vanmali: Victor Gruen’s early malls were conceived to be hubs of larger communities. People going to the mall were not simply going somewhere to buy something, rather they wanted to have an experience where they could connect with others—and also shop. In my opinion, a problem that developed over the years was that shopping became only about buying things and less about the experience of being in a particular place. Orlando Gonzalez: Let’s remember: A lot of Gruen’s early works also included varied spaces for concerts, public functions, and temporary programmed activities. A lot of these functions, however, were stripped away over time for cost reasons. The public gathering spaces Victor Gruen originally envisioned were reduced to walking corridors and food courts in favor of more leasable space. It has not been so much the “death of retail” as it has been the neglect of public amenity space, and the condition of it, which married the pedestrian to the retail environment. AN: What are some of the other aspects of design Gruen Associates is focusing on in recent retail-oriented projects? Barnes: We’ve seen a strong shift toward fewer of the carbon-copy stores that brands used to depend on to maintain their image. Now retailers are taking a more site-specific approach to their “brand-itecture”—selling the goods in a space that is unique to that city. In many cities, retailers are taking over historic buildings in lieu of a leased spot in the mall to give their stores a sense of authenticity. Vanmali: The luxury retailers we work with focus on the experience and on ambiance— how comfortable the spaces are, how clients are served. For example, one of our strategies revolved around making the shop look more like a home than a store with elements like fireplaces, lounge seating, and artwork. That way, the customer doesn’t necessarily feel like they’re shopping. AN: A lot of the malls today are [also] converting shopping areas into food-focused hubs. People go out to eat and then shopping follows. Gonzalez: They’re re-creating public gathering spaces, as Victor Gruen emphasized early on. He wanted to bring the public open space he experienced in his native Vienna to the new public gathering spaces of the United States. These spaces were designed to catalyze interaction, collaboration, and socio-economic progress. These principles are very much in line with how we design similar types of projects today. AN: So do you see current contemporary trends as moving back toward that previous pattern? Vanmali: Somewhat, but it’s not really “going back,” it is more like recapturing some of the original ideas and excitement that malls once brought. I don’t think today’s technology-driven lifestyles fit into those old models exactly. It’s evolving. Matthew Parrent: There are a lot of aspects, however, that are similar. 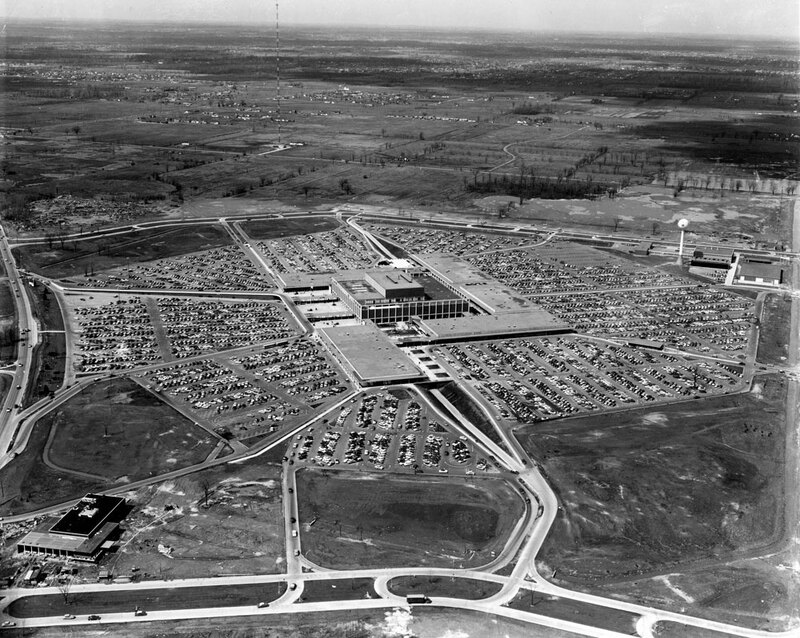 The intention with the Northland and Southland Malls in Michigan— some of the first malls we built in the 1950s— was to make the mall a town center. There would be a postoffice, a medical center, and housing. Barnes: The suburban mall revolved around the family car. Now we have smartphones— and live in urban hubs with better public transportation. I’d say “evolving” is a good word to describe that process. Parrent: The thread to today is there from those initial malls—people want public experiences, they want to gather, and they still want to shop. Shopping is not going to die. AN: Right, retailers aren’t necessarily losing money—it’s just coming from different places. Barnes: We, as architects, are excited about how brands are dramatically reinventing themselves right now. It gives us more room for creativity and our clients new options for generating revenue. Vanmali: Luxury retailers have always had to periodically reinvent themselves. Most retailers in malls sign five to ten-year leases, and, at the end of those leases, they go back and renovate the spaces with new concepts. Now that products are more accessible via the internet, the physical manifestation of a brand has to be even more special. AN: So, are malls going to have to reinvent themselves? Vanmali: Definitely, they are going to have to reinvent themselves for the communities they serve. Parrent: We can see those existing malls transforming already. We have had several projects where we have proposed to insert a variety of uses onto former parking lots to create more holistic developments. People want to shop in places that have some history. We worked on a conceptual master plan for the Southern California Association of Governments in Cerritos, California, recently, where we proposed creating a walkable regional transportation hub on a mall parking lot. Gonzalez: And in that project, we took supersized parking lots that are 800 or 900 feet wide and broke them up to be human scaled, walkable blocks that are 300 to 500 feet long. We are designing these types of projects with a mix of uses and multimodal streetscapes. The healthy integration of streets, blocks, and buildings at a human scale is a basic ingredient of any livable community. These ingredients have never really changed, only how we as designers have composed them. 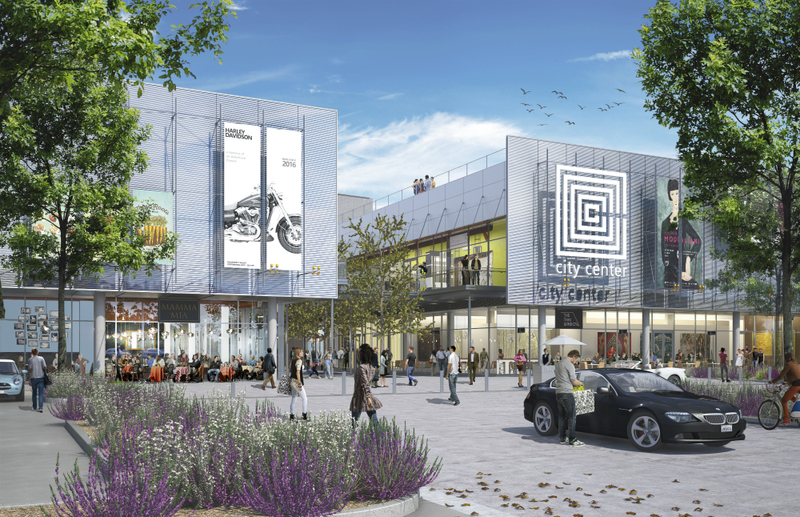 A long-awaited mixed-use renovation and expansion plan led by international architecture firm Gensler and developer Forest City for the aging South Gate Galleria complex in Redondo Beach, California was finally revealed late last week. The plan calls for adding 300 housing units and a 150-bed hotel over an existing mall parking lot, demolishing several existing shopping structures, and redesigning retail areas with a new focus on open-air dining and pedestrian accessibility. A rendering released for the project depicts a grand lawn surrounded by open air dining spaces while elevations for the project showcase a mix of building forms, including a traditional apartment block, a balconied hotel, and re-skinned existing mall structures. The project site plan features generous planted open spaces at the site’s northeast corner, where a series of swales and trails wind from the busy intersection of Artesia Boulevard and Hawthorne Boulevard toward the proposed hotel. The project team also includes AHBE Landscape Architects; KGM Architectural Lighting; RSM Design; Tait & Associates engineers; and architects Togawa Smith Martin. Regarding the project, Forest City president Ratner told The Daily Breeze, “we want to enable people to use public transportation, walk or bike to shopping and dining destinations and use their cars a lot less than they do today.” Ratner added, “the proposed development will pay significant attention to better pedestrian and bicycle access and will promote easy transitions between a variety of transportation options.” The 29.85-acre site was identified in the City of Redondo Beach 2013-2021 General Plan Housing Element as the site with the “greatest potential for future residential development” in the city and as “an ideal location for transit-oriented development involving high-density residential uses” due to its proximity to a new stop along a forthcoming expansion of the regional Green Line light rail line that runs through the area. Despite that vaulted status, the project density has gradually fallen over time. Originally, the project was proposed with 480 residential units, a number that had to be scaled back after community opposition arose against the added residential density. The site itself is zoned for up to 650 units, according to a Draft Environmental Impact Report. The project is currently open for public comment as it makes its way through the environmental review process. This article appears in The Architect’s Newspaper’s April 2017 issue, which takes a deep dive into Florida to coincide with the upcoming AIA Conference on Architecture in Orlando (April 27 to 29). We’re publishing the issue online as the Conference approaches—click here to see the latest articles to be uploaded. When Victor Gruen designed the first contemporary American malls in the mid-1950s, he changed the changed the way Americans shopped. Much to his chagrin, however, what malls would become over the next 50 years would be far from the civic social suburban spaces that he had envisioned. He would eventually distance himself from the typology. Today, malls, as a typology, are going through major change. Whether due to a changing economy or a changing customer base, malls—as 1990s mall rats knew them—are disappearing. Instead, new configurations and old ideas are shaping the way people are shopping, and if there is one place to look at this change, it’s Florida. Florida has weathered the last decade relatively well. Buoyed by its massive tourist industry and the ever-replenished retiring baby boomer population, malls across the state still draw crowds. Even so, these palaces of consumerism are not impervious to the changing tastes of the country. As national retailers such as Macy’s and J.C. Penney fall on hard times, the anchor stores have become literal anchors—dragging. Although new “traditional” malls are rarely being built, shopping centers are still popping up, or being reformatted. Perhaps ironically, one of the most popular mall replacements are retail streets. Many of these have been commercial centers for decades, but so many of them declined as malls gained in popularity. Across Southern Florida, the towns and suburbs surrounding Miami have rushed to remodel and reinvigorate their “urban” shopping streets. The next of these to be realized will be Coral Gables’ Miracle Mile. The half-mile main east-west drag through town, Coral Way, has been home to numerous mom-and-pop stores, many of which have struggled to survive. The urban design, by New York firms Cooper Robertson and Local Office Landscape Architecture, aims to replace the narrow sidewalks and copious angled street parking with a more pedestrian-friendly experience. Flexible plazas, outdoor dining spaces, enlarged planted areas, redesigned wayfinding graphics, and an improved lighting scheme will be used on and beyond the Miracle Mile. Stretching off on neighboring side streets and focusing on intersections, the plan will reframe the area as a full retail district. While the model for the project is a European shopping experience, overhead LED lighting and bright street pavers will be decidedly Florida, evoking the shapes and movement of raindrops and water ripples. 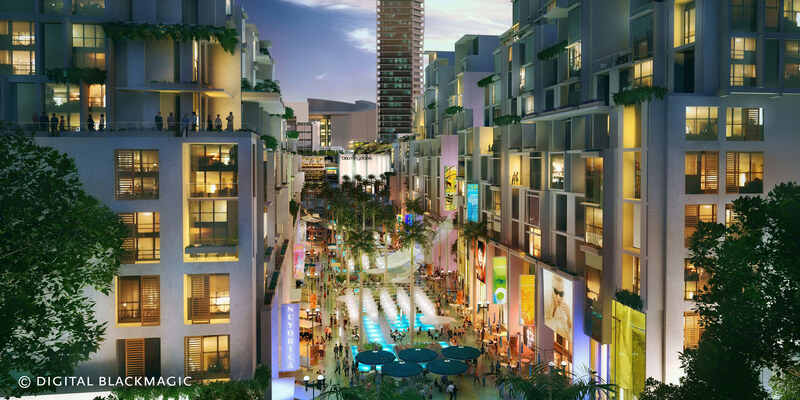 The Miracle Mile will be just one of the many revitalized shopping streets in the Miami area. It will join Palm Beach’s Sunset Drive and Worth Avenue, and Lincoln Road Mall in Miami Beach as alternatives to traditional malls. Yet while these more established venues are seeing new life, traditional malls are being completely rethought. New retailers and new customer expectations are being formalized as street-mall hybrids on a scale that has not been seen before. The Miami Worldcenter will be a 27-acre mixed-use development in downtown Miami. At the heart of the $2 billion project is a “High Street retail promenade and plaza” which will include retail, dining, and entertainment along a pedestrian street. The project is so large—it will also contain 2,000 residential units and 1,700 hotel rooms—that it will connect the Central Business District and the Arts & Entertainment District, changing the way tourists and Miamians move through the downtown. Boston-based Elkus Manfredi Architects is leading the master planning as well as designing three of the buildings for the project. The firm’s experience designing the extremely popular Grove and Downtown Disney projects in Southern California make it particularly suited for the project. Even so, the Worldcenter is on a much larger scale and addresses particularities of downtown Miami. In its original form, the Worldcenter resembled a more traditional mall, a three-level indoor shopping experience with large big-box anchors. Over the course of the design, the nature of retail had changed enough that the anchor-store model was rethought. The project quickly shifted to a more urban plan with separate blocks and pedestrian streets. Luckily for the development, a recent change in Miami’s zoning code made the project possible as an outdoor retail district. In particular, the Miami 21 zoning code, a new form based code that regulates building form standards, public space, and street standards. The code is guided by base tenets of the New Urbanism and Smart Growth movements. Both focus on pedestrian- and community-based design. As customers demand more engaging shopping experiences with more complex programs, retail developers are not far behind with epic new shopping districts. From rehabilitated retail streets to newly built mixed-use districts, shoppers may soon be more likely to run into dapper flaneurs than escalator-riding mall rats. Even just three years later, it is difficult to imagine the “traditional” mall having a place, even in the most quintessential American suburb, 10 years from now. But while clearly the malls of the 1970s through the ’90s are not the future, the great irony here is that Caruso specializes in developing malls—luxury outdoor malls, such as the Grove in Los Angeles and the Americana at Brand in Glendale, California. And indeed, just as quickly as those once-ubiquitous beige shopping centers are being torn down across the U.S., shinier, flashier moneymaking entities are popping up in their place. The Mall 2.0, it seems, is an artificial landscape sans Sbarro and JCPenny’s, with a plethora of vaguely European structures and simulated boutique experiences in their place. Already, it feels like it’s time to reflect on whether or not these new “shopping experiences” will fare any better than their forebears. 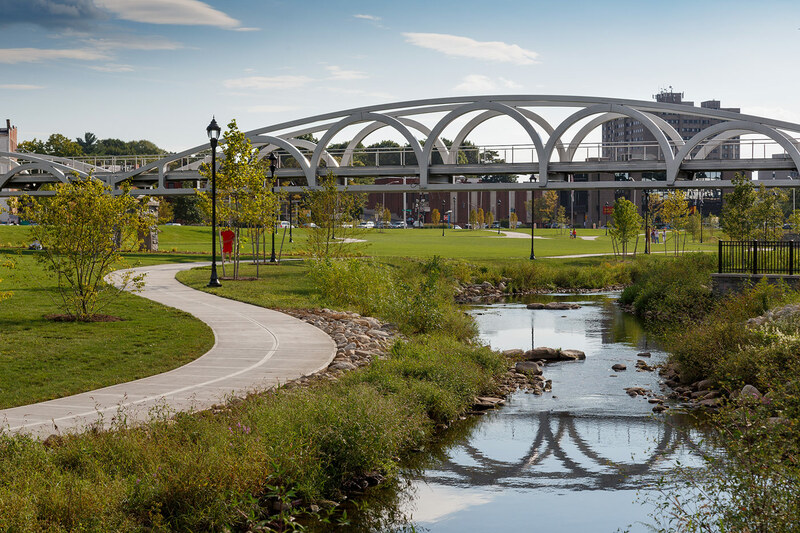 However, in Meriden, Connecticut, a town located halfway between New Haven and Hartford, city leaders took an alternate route: transforming a former mall into a resilient 14.4-acre park replete with pedestrian bridges, a 2,150-square-foot amphitheater, a remediated landscape with a flood-control pond, and even drivable turf to accommodate food trucks and farmers markets. More radically, there are future plans to reduce the downtown infrastructure: “The downtown will go back to two-way traffic, like it was in the ’50s,” said Vincent Della Rocca, project manager at La Rosa Construction, a local family-owned business that helped create Meriden Green. The $14 million project was no simple feat, involving an extensive overhaul of a formerly blighted area that locals called “The Hub.” In the 1950s and ’60s, the city began developing the space to bolster economic development, and in 1971 the Meriden Mall was built on the site. In the process, the Harbor Brook—technically three different brooks—was obstructed by a maze of underground pipes. The mall closed and in 1992 and 1996 flooding caused by the blocked water streams caused $30 million in damages to the downtown area. The city took possession of the property in 2005, and it was deemed a brownfield site. A Hub Site Reuse Committee was formed and began making plans to transform the area, creating the Site Reuse Plan in 2007. Years of approval processes and funding grants later, the City of Meriden’s design team, engineering firm Milone and MacBroom, and LaRosa Construction broke ground in November 2013. Due to it being a former brownfield site, there were many unforeseen obstacles, such as underground oil tanks that had to be removed. The brook was exposed and diverted, “the site was cleaned, foundations were crushed, and six inches of topsoil were placed,” explained Della Rocca; additional landscaping included adding drainage channels, pedestrian bridges, and concrete pathways. Meriden Green opened in September 2016, with future plans to build a new train station and a mixed-use commercial and residential building nearby. It is a soothing green space that brings families and community events to mind. Hanover Pond and the brook that feeds into it offer charm and respite in addition to their crucial flood-control functions. It’s an optimistic project and one that simply makes good sense—the idea that green spaces offer the type of future-proofing no amount of luxurious shopping can ensure. “Today, ladies and gentlemen, is more than just the opening of a park, it’s more than just a grand flood-control measure,” Mayor Kevin Scarpati said at the opening. “This is the start of a new downtown; this is the start of a new Meriden.” And, if others take note, the state of the new suburban mall, as well. This article appears on HoverPin, a new app that lets you build personalized maps of geo-related online content based on your interests: architecture, food, culture, fitness, and more. Never miss The Architect’s Newspaper’s coverage of your area and discover new, exciting projects wherever you go! See our HoverPin layer here and download the app from the Apple Store. When wives or girlfriends utter the phrase "Let's go shopping!" on a Saturday afternoon, husbands and boyfriends may groan at the thought of the impending boredom, or find themselves suddenly paralyzed by the fear of hours on end in the women's section of local department stores. In an effort to create a more pleasant mall experience for both genders, the Vanke Mall in Shanghai recently opened a "Husband Nursery." The space (originally reported on by China Daily) is equipped with lounge chairs, a massage chair, a television, a fridge, magazines, and newspapers. Husbands and boyfriends can relax while their wives and girlfriends are cruising the shopping floors. When those ladies are all spent and ready to go, they'll know where to find their significant others. Located in Qibao, a smaller town in the Minhang District of Shanghai, Vanke Mall also offers a Tree House playground for kids. For the last several years, Renzo Piano Building Workshop (RPBW) has been quietly working in the Northern California city of San Ramon on a scheme that aims to reinvent the suburban shopping mall as a new kind urban typology. 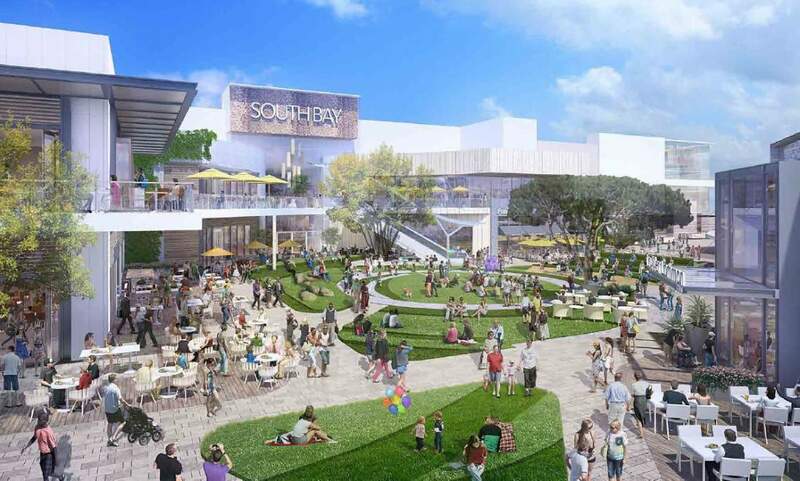 The project, City Center Bishop Ranch, would create a new interpretation of the shopping mall in an affluent suburb located a 35-mile drive away from San Francisco by transforming it into a cultural and entertainment destination. The resulting 15-acre, 300,000-square foot shopping, dining, and entertainment district aims to become a new locus of intergenerational public interaction that, according to RPBW, is inherently missing from many suburban areas. The scheme attempts to subvert normative and typically linear New Urbanist-inspired main street revitalization approaches—streets that go “from nowhere to nowhere,” according to the project’s website—by creating a loop of porous commercial and social spaces on a large, planted site. RPBW argues that “main street” schemes typically push the functional aspects of commercial corridors like loading docks and parking structures away from storefront-activated street fronts, creating an impenetrable wall around these developments that stifles their integration into surrounding areas. 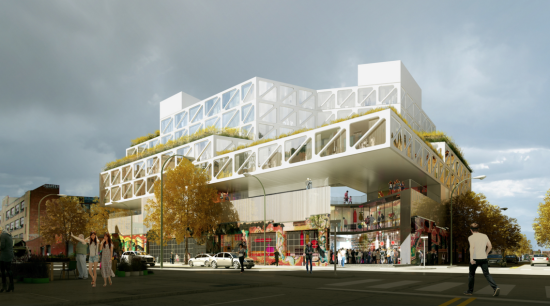 RPBW’s response is a porous, pedestrianized mixed-use area with “no back doors” bounded by a porous perimeter that absorbs surrounding traffic, concealing automobiles into overhead parking garages. As such, renderings for the project depict a complex of three-story structures surrounded by leafy open space. The mall, carved into a cluster of buildings surrounding a central, open square, features glass-clad facades along ground floor areas, while second floor and third floor uses are wrapped in sheets of folded metal panels designed to deflect rays of the sun at specific angles. The project is currently under construction and to be completed in 2018. 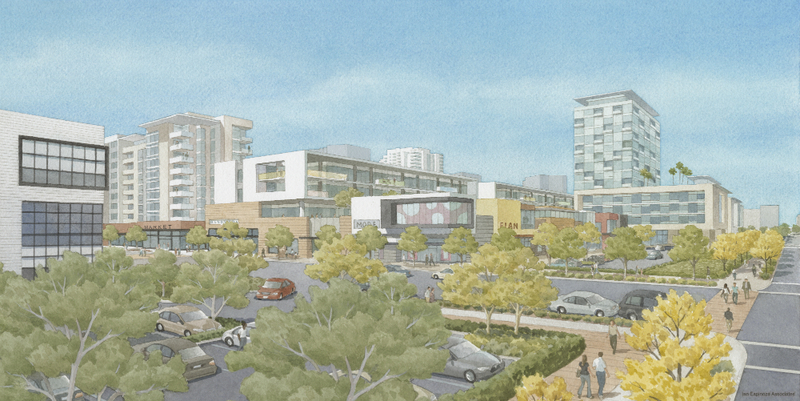 For more information on City Center Bishop Ranch, see the project website. The Westfield Corporation has filed plans to demolish its 43-year old Promenade mall in the far-western San Fernando Valley of Los Angeles, aiming to replace the aging complex with a $1.5-billion mixed-use development containing 1,400 residences. The project, with design by Westfield's in-house design and architecture as well as HKS, Johnson Fain, and Togawa Smith Martin Architects, is inspired by the Warner Center 2035 master plan for the surrounding area, which calls for converting the Warner Center purpose-built business district into a functionally-diverse urban neighborhood. Among other things, the plan calls for “a mix of uses that are within walking distance of one another so people can easily walk rather than drive.” The area’s plan, to be implemented in 2035, would also aim to create "complete streets" that “accommodate alternatives to the car, in particular, an internal circulator in the form of a modern streetcar and ‘small slow vehicle’ lanes for bicycles, Segway-like vehicles, electric bicycles, other small electric vehicles, and any other vehicle that does not move faster than a bicycle.” Plans for the Westfield site would incorporate these principles through the addition of new internal, pedestrianized streets that connect to major thoroughfares as well as the use of the site as for “open streets” events that are closed to automobile traffic. Westfield Corporation’s plan for the Promenade mall, sitting just across the street from the area’s namesake Warner Center towers, calls for the addition of 1,400 residential units, 150,000 square feet creative office, 470,000 square feet Class-A office space, and 244,000 square feet of commercial retail space. The project will also contain a 272-room hotel adjacent to the creative offices and a second, 300-room hotel that will be physically connected to the Class-A office component. The housing components of the project will be arranged in low-rise courtyard complexes while the office and hotel components will hug the western and southern edges of the site. Another central component of the project involves a so-called “Entertainment and Sports Center” that will accommodate flexible seating for up to 15,000 spectators. The sports center will aim to boost the community-minded aspects of the new complex, with also include a one-acre central park and upwards of five-acres of rooftop gardens and patio spaces. Construction on the complex is due to begin in 2020 or 2021 and will continue in phases until 2035. Naturally, the project has its vehement critics, with some labelling the project as a "dystopia waiting to happen." Only time will tell if Dubai's dome is doomed. 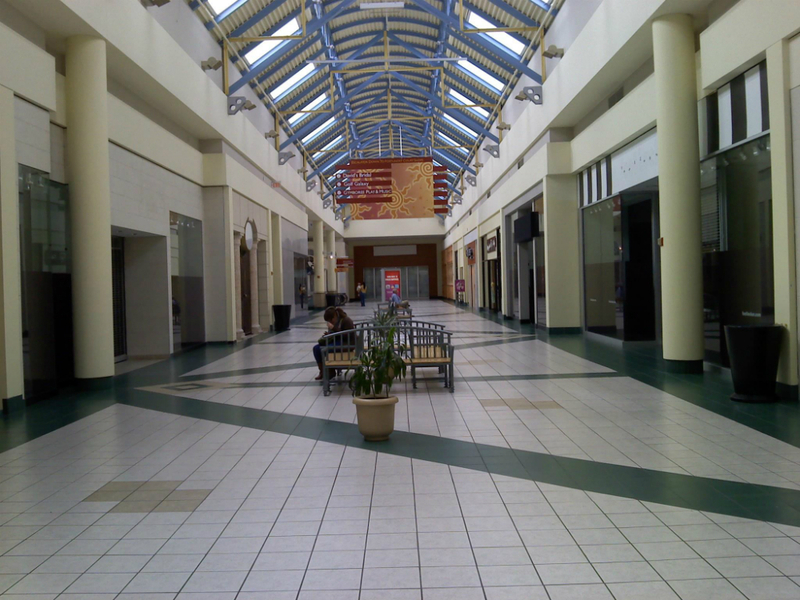 Search Twitter for #mallmonday and see a hilariously bleak photo series that profiles different malls, some dead, some impossibly sad, each week. Why are these depressing spaces so popular with architects? By giving new life to these huge, redundant spaces, architects tap into ruinophilia to feed a culturally ingrained desire for dramatic transformation and also temper the excesses of capitalism, maybe. In the Texas capital, Austin Community College annexed semi-vacant Highland Mall for a new campus, while NBBJ is reviving a dead mall in downtown Columbus. 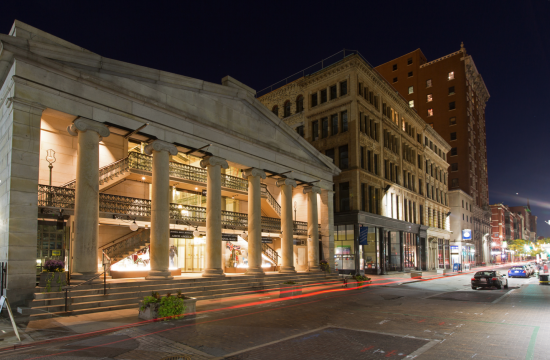 In Providence, Rhode Island, Northeast Collaborative Architects (NCA) handily combined dead mall revivification with micro-apartments, for an timely transformation of downtown's Arcade Providence, the oldest shopping mall in the United States. The 1828 Greek Revival–style mall was closed for the last three years. Designed by Russell Warren and James Bucklin, the three-story mall was America's first enclosed shopping arcade. In a $7 million renovation, Providence-based NCA turned the mall, a National Historic Landmark, into a mixed-use development with 17 retail stores on the ground floor and 48 micro-apartments on top. Apartments open out onto a shared walkway, an arrangement that would be penitentiary-chic if not for a skylit atrium. Unlike micro-apartments in New York, where market-rate rents at Carmel Place range from $2,540 to $2,910 per month, rents at Arcade Providence begin at $550 per month for a 225 to 450 square-foot one-bedroom, My Modern Met reports. (Two- and three-bedroom units are also available.) Those units come with a full bathroom, kitchenette, and a built-in bed with storage. Tenants have access to shared laundry, TV room, and game room, as well as bike storage, and parking. Right now, the only catch for prospective tenants is the 4,000 person waiting list. Master box-stacking architecture firm ODA has unveiled its latest addition to the Brooklyn cityscape: an eight story, mixed-used development at 71 White Street in East Williamsburg. The approximately 80,700-square-foot hotel, retail, and semi-public space will rise from the skeleton of an existing one-story, graffiti-adorned 1930s warehouse. Calling 71 White Street a mall would undermine the grittiness it strives so hard to project. Yet, its circulation pattern and its relationship to the street speaks for itself. The complex's stacked and rotated layers recede from, yet tower over, the existing low-slung street wall to create a series of insular private and public spaces. The main entrance, on the corner of McKibben and White streets, is set deep into the lot, drawing visitors though indoor and outdoor corridors to access food, drink, and entertainment. The first two floors are programmed for restaurant and retail space. Ground-floor windows would punctuate the now window-deficient facade, and create visual interest on the street. The top five floors are given over to a 112 room hotel. That hotel will provide de facto amenities: gym, rooftop bar, and pool. In addition, renderings depict multiple, expansive shared terraces that afford views of Manhattan. For those interested in people-watching, the third floor will be an open-air public promenade. To access the third floor space from the main entrance, a set of stairs slopes gently upward and diverges, giving access to the east and west ends of the structure. The circulation pattern will accommodate a range of uses: on the west end, an amphitheater slopes down to the ground floor, while the east end appears to be reserved for more quiet activities, like eating at picnic tables.